Join 13,697 other online Players! Just updated the Arena Brawl with a bunch of features and the rating has been reset to 1000 for everyone. As for now you can play and report bugs, the top 3 beta players before release will receive Creeper Pets! You can now get unique Hats and Skills from the Magical Chest! However you will need keys that only the Arena Challenger can provide in exchange for win streaks or coins. Now featuring the new Ultimate Skill, Runes and Hats. Runes are applied to your weapon and only one rune at a time can be activated. They are expensive as they are meant to be slowly upgraded over time. To add more diversity and customization to Arena Brawl, we added the Ultimate Skill that can only be used once per game. For now there's only 2 skills available but we plan to add a lot more. If you are lucky enough with the Magical Chest, you will receive cool unique hats that will say random things to your enemies in the Arena Brawl games! Collect them all, just like Pokemons! The higher your rating will be, better looking your character will be! Some new skills have been released and we will keep adding some of them this week! Achievements are in the next update. We are aiming to release Arena Brawl this upcoming weekend. The first Mega Walls tournament just ended after 36 hours! Here is the list of the top 100 players and some more information. I will be giving over a grand total of around $2000 worth of credits on the Hypixel store shared amongst the top 20 players. The top 100 players will receive extra Tournament Tokens that can be exchanged for unique perks/kits and more on the Hypixel Network in any games. The top guilds (2 or more guilds) will be facing each other in the next few days/weeks. We will be taking into account all players that participated in the current tournament to determinate the best guilds that would give us a good tournament and the guild members will be contacted in game to organize private games. The winners of the tournament will have to face the admin team for an extra prize! If you are in the top 20, please make sure you have an account on the website so I can contact you with your store credits. It will not be possible to give it a friend, the redeem code will only work for your own username. If you are in the top 3, feel free to give a speech and it will be quoted in this post. Thank you everyone for participating, we have gathered a lot of data and feedback to improve the next tournament! Please note that the next Mega Walls tournament will have team selection disabled. PRIZES WILL TAKE UP TO 2 DAYS TO WORK! Here's some information about the upcoming first Mega Walls Tournament that will be occurring the next weekend. The tournament will last around 36 hours on March 15-16. Starting at 9:00 am US EST saturday and ending 36 hours later at 9:00 pm US EST sunday. Just by playing Mega Walls on that weekend when the Tournament happens, you will be automatically participating gaining rating and acquiring tournament tokens. There will be a stats called "Tournament Rating" that will act like a ladder system to sort out the top players. Wins and final kills will reward rating. Losing, leaving and dying will subtract rating. You can't go below 0 rating, don't worry about that. You will be able to see your Tournament Rating on the scoreboard in the Mega Walls lobby. Leaving before the game ends means you have to stay till the game end to get your rating if your team wins, otherwise it counts as a loss for you. What we might do if we have time before weekend: The higher your rating is, the rating gain/lose changes, making it harder as you go up and easier for new players to climb to the top. This will sort out the top 20 players and the top guilds. We will be giving over a grand total of $2000 worth of credits on the Hypixel store shared amongst the top 20 players. The top 20 players will also receive extra Tournament Tokens that can be exchanged for unique perks/kits and more on the Hypixel Network in any games. 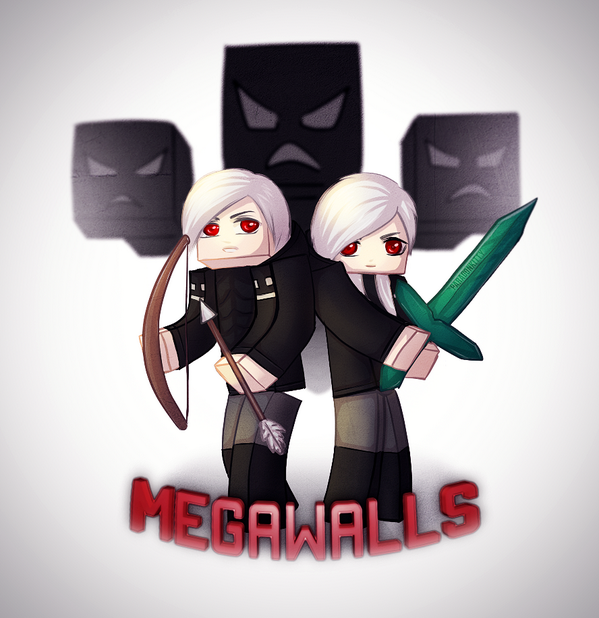 The Mega Walls tournament perks will be added in the next few days in the Mega Walls shop. Creeper pets for the top 5 and an extra pet Blaze for the number 1. More prizes will be added in the next few days. Note that the top 5 will get a large % of the store credits. We figured we could have an extra tournament for the top guilds. We will take the 2 best guilds and make them versus each other in a private 10v10 Mega Walls game on March 23. The event will be recorded and the winners will receive 100,000 guild coins. Every time there is a tournament going, you will be able to earn a maximum of 20 Tournament Tokens by playing games. The top players of a tournament will receive additional Tournament Tokens of course, making them a step ahead on kool unique perks, but still making those perks available in the future for participants that were not fortunate enough to win. Tournament Tokens will be global, which means you could earn yours in Mega Walls but use them in the Quakecraft shop. You can spend to unlock unique perks, items, kits and much more. Tournament Tokens will not and never be in the online store. This tournament system is not perfect but will allow everyone to participate and get some tokens. Because in the end, not everyone can win. We can't do organized matches with over 400,000 participants, we need to find out who are the best players in ladders, just like League of Legends, World of Warcraft or any other games. They didn't do organized tournament before they knew who were their top players and then organize professional tournament with them. World of Warcraft for example had this place called Arena Tournament where you would fight your way up with rating, then the top teams would get to participate in the championships. I want to have public ladder tournament, not private where only a selected 100 people get to play over 400,000. Now we are going to have a weekend full of people playing Mega Walls. Even solo players can have fun this weekend, however I suggest playing with friends to make your journey easier! Thanks to our sponsors MCProHosting for giving us the stability and opportunity to host the tournament! What will be your class of choice for this tournament ? Big news! New Host, Mega Walls Tournament, Arena Brawl Beta, European Servers and more! New host, EU Servers, New Minigame, Mega Walls Tournament and more! We are proud to announce that we are now finally 100% moved over to the new host MCProHosting! MCProHosting is giving 75% OFF all their Minecraft servers for the next 7 days with the coupon code “Hypixel”. Yes, that means you can get a 18 slot Minecraft server for as low as $1.50! I’m going to give 8,000 coins (spread across all games, 1K each, even Arena Brawl!) to everyone that order their Dirt Plan or anything higher! This deal is only redeemable once per player and will end in 7 days, limited time don’t miss it! It’s their way to let you guys try their services at a ridiculously never-seen before price. I am positive that we can get them busy and I’m confident that they will serve you well! Let me repeat; you can get a Minecraft server along with 8,000 coins on the Hypixel Network for as low as $1.50! You will receive a redeem code by email from MCProHosting. FINALLY! I’m happy to announce that we are now working on setting up servers for EU players within the next few weeks/months for top quality ping! It will use the same stats/kills/ranks so don’t need to worry about that, keep playing on US servers in the meantime and grind some kills! More details will be revealed in the next few days. We will be using a new technology allowing US and EU players to play on the same network. The first MEGA WALLS tournament will happen on the 15th of March and everyone will be able to participate, no registration required! You will be able to collect Tournament Tokens to unlock unique items in all games! The top players/guilds will share over $2,000 in Hypixel Store / Physical prices along with extra Tournament Tokens. More info will be released in the following days. Edit: Beta Released to VIP's and up! The version you will be playing is far from the complete version of the game, but we need a lot of testing since it’s a competitive game. Herobrine III is coming too! We are currently in testing phase, adding NPCs for storyline and such. There is over 24500 command blocks, it is our biggest and most intense adventure map. We are planning to release a few days after 1.8. After we are done with the Arena Brawl in a few weeks, we will be working on The Arcade Games and trust me, this is gonna be a lot of fun! The Arcade Coins will be exchangeable for other games. Why did we change hosts? A few months ago we changed hosts, but we all underestimated the scale at which the Hypixel Network is growing resulting in some issues. In the past few days the old server was getting DDoS over 15 times a day and the old data center couldn’t fulfill our needs. They couldn’t handle our internal network and we couldn’t install DDoS protection meaning it was vulnerable to attacks and network crashes. We had more than 6 hours of downtime in the last week of usage, players were slowly leaving because of lag, disconnections and instability of the server. For us it was a nightmare; instead of working on new features/games/maps we had to stay up all night to do system administration to make sure everything was working, it was horrible. Most of you should have similar, if not better, ping. If you notice higher ping it’s because we moved to Central US based servers and our DDoS protection systems may cause a slight increase in ping, this is because all traffic has to be filtered before it gets to us. To counter that we upgraded all our hardware to more powerful machines and we are going to make even more improvements. All this, coupled with our newly announced EU servers, and you should have an excellent experience with us! As a competitive player myself, I know it is very important on a PvP server to have good ping and I’ll make sure I deliver the best options I can. Keep in mind that we can’t get rid of DDoS as we wish; the Hypixel Network is probably one of the biggest target of DDoS attacks for Minecraft. If you experience lag or disconnections sometimes, it’s most likely our DDoS protection provider having issues, so far our new servers have 100% uptime. Now that we are stable, we can get work on bringing you new content! I'll do my best to post more news and patch notes on the website now that we have some more time. Have fun and get ready for Arena Brawl! Twitter Fan Art Contest - Winners! Last week on twitter I asked you guys to send me fan art of your favorite game to get 30,000 coins and I finally picked the winners! Double Coins Weekend and some random news! Hi, I bring good news! Oh, almost forgot... new website coming up soon!